Apple's class is a mindful and gentle vinyasa yoga practice. She strongly believes that yoga practice as a tool helps us to be more aware of ourselves. And the practice should be beneficial for both body and mind. She would love her students to practice toward balancing. So she encorages students to mindfully observe themselves and gently move with space into and out of postures. For her, how it feels is more important than how it looks. completing the teacher training with Adrian Cox. Apple is willing to share and at the same time willing to learn from her students. She respects all and understands that we are all different. 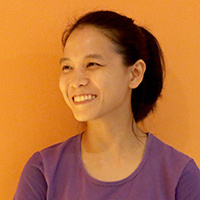 Dee is certified RYS200 from Yoga Elements, Bangkok, Thailand. Her classes basis on Vinyasa flow. Each class of hers, will learn in details, gain strong fundamentals with good alignment, technique and breath transition. Her soft and gentle voice will bring you deep to your practices and full relaxation after the class. With her knowledge, experience and passion of teaching all kind levels of practitioners, She will provide a class that suitable with your own style, either empower, energizing, gentle or relaxing. She keep learning by taking course and workshop to top-up her knowledge. Those information in her class are easy to understand and useful for daily life. a student to feel body and mind with a conscious breathing. It's time to meet a creative and easy way to approach advanced asanas while keeping essential alignments to prevent injuries. Yoga Alliance RYT-200 and RPYT. Her boundary of yoga experience expands to Vinyasa, Ashtanga, lyengar, and Hatha since 2005. Osteopathy is an internationally recognized manual medicine that focuses on holistic body health. Its main emphasis lays on the structural and functional integrity of the musculoskeletal system. It positively affects all the systems of the body. It uses a variety of hands-on physical treatments that are usually employed along with exercise, occupational and dietary advice in order to help the person recover from injury and pain. Osteopathy is also widely used for wellness. Juan is certified in Osteopathy, Chiromassage and Sports Massage. He has over 15 years of experience as a manual therapist, which he combines with his experience as a certified Personal Trainer and Therapeutic Exercise Specialist. He has a gentle and caring approach. Qigong has a health and medical focus and have been refined for well over 5000 years in Chinese history. Qigong therapy consists of a series of orchestrated practices and treatment, including body posture/movement, breathe practice, and meditation, all designed to enhance Qi function (that is, drawing upon natural forces to optimize and balance energy within) through the attainment of deeply focused and relaxed states. Qigong therapy can promote circulation, physical function and relieve chronic pain.